Cypress Course at the Grand Club in Palm Coast. Created by Gary Player, this scenic and challenging golf course measures 6,591 yards and is designed to conform to the boundaries of native wetlands and natural lakes. A very challenging course that pays rewards for short game players. You don't have to drive 300 yards to give yourself birdie chances. Facilities and services are top shelf .just go and see for yourself. Pine Course at the Grand Club in Palm Coast This Palmer-Seay design is a challenging 7,074 yard layout featuring water on eleven holes, rolling fairways and manicured greens. A fixture among the rankings of Florida' 5 best, the Pine Course has hosted scores of professional and prestigious amateur events. Fortunately for big hitters, it can also be forgiving. There is water on half its holes, and long-iron approach shots are not uncommon. The Club at Grand Haven. This is a fantastic private club and very difficult to get on without a member. Personally designed by golfing legend Jack Nicklaus, it is among a select group of courses in the world that can truly be called a Jack Nicklaus Signature Course. The manicured greens and fairways of this par 72 Private Club offer a challenge worthy of the world’s top players, at the same time, provide enjoyable year-round play for members and quests at every level. 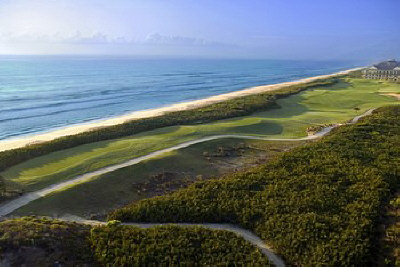 Ocean Course - Hammock Beach. Private Club. Immaculate golf course, one of the best in Florida. Spectacular and challenging Jack Nicklaus design makes you use every club in the bag. Very challenging and definitely not for the hackers.